Details The Techconnect Control3 is the most flexible professional AV control device available. 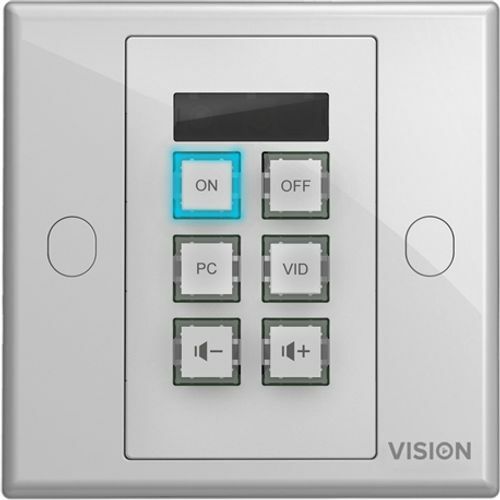 A simple control panel controls everything and only presents users with the functions they use every day. No tech support calls. No losing remote controls. All in a secure Techconnect module. Simple Mode Hold down the two middle buttons to put Control3 into learn mode, point the original device remote at the front of the Control3, and program one code per button. Off is pre-set to send the code twice for projectors, and the bottom buttons send codes repeatedly when held down. Advanced Mode Connect to a PC and use included software to allocate multiple RS-232, IR, and 12v triggers to each button. Commands for each button can be sent simultaneously, sequentially, or repeatedly if you hold the button down. Labels Clear caps unclip off the buttons from the front to allow label changes. A set of printed labels are included, and users can print their own as necessary. Backlit buttons Backlit buttons are easy to read. If any buttons are not used blank buttons are included which block the backlight. Scheduling Once programmed, a schedule can be setup. Delay Commands can be delayed up to 60 seconds. For example when you turn a projector on it takes time to warm up so the motorised screen doesnt come down until the projector is ready.